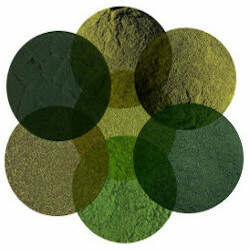 This is our SuperGreens Powder with Alfalfa Leaf Powder, Barley Grass Powder, Broccoli Sprout Powder, Chlorella Powder, Spinach Powder, Spirulina Powder and Wheat Grass Powder. All ingredients are organic. To see benefits of all the ingredients, view individual items. 7 to 14 teaspoons per day or as directed by your wellness coach. This item will be added to your shopping cart order in a 1 pound package. What an amazing supergreen combo! I take my "normal" serving on regular days and on days when I am doing strenuous activity I double my serving. I then have the extra strength and energy to do my activity. I also notice down time is little to none and my recovery is super fast compared to when I used to do a single serving on those days. Most brands put such a small amount of a lot of ingredients there isn't enough to realize what they are doing. You took the most compatible for most people and did the opposite. I can feel the individual ingredients doing what they are made to do! I have been purchasing herbal supplements and more for many years and your follow up and service has been second to none. Bless you!